In Japan most things are done according to customs and tradition. Perhaps this explains why most foreigners often complain that it takes a long time for implementing a “change” in Japan. 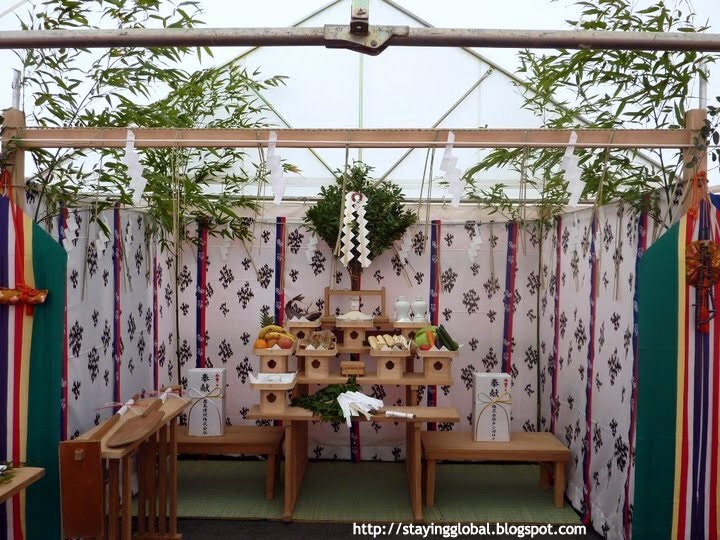 It is a common practice in Japan for people to visit a shrine before they begin a new job or start a new business. For instance, the Japanese greeting for New year’s Day is “Äkemashite Omedetou Gozaimasu” which translates to “Congratulations for opening the New Year”. This also explains the first shrine visit on New Year’s Day- to seek blessings for the entire year on the day when a new year is “opened” ! 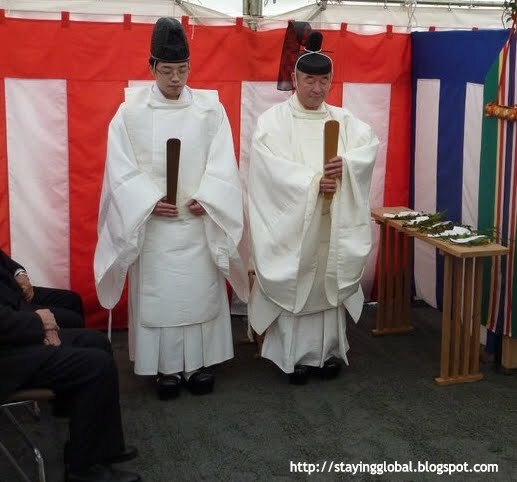 Since the Shinto beliefs are held in high regard, people usually organize elaborate purification ceremonies before starting new important activities like constructing a new building or purchasing a new car. Construction is considered as causing massive changes to the land. 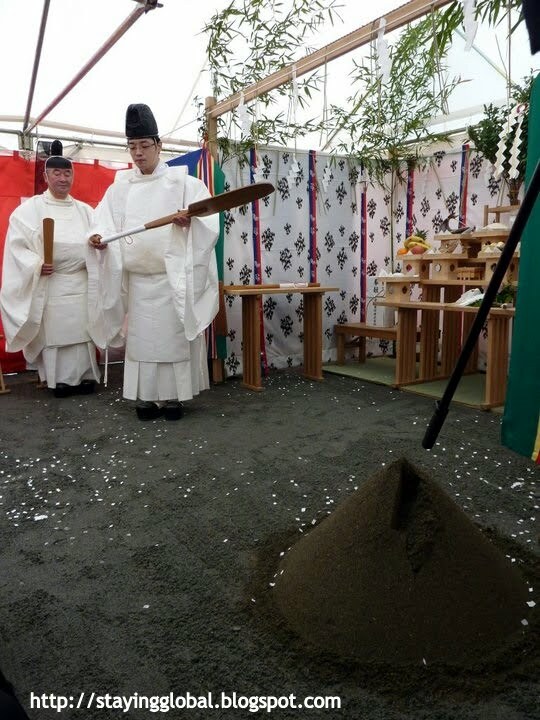 As such the “Kami of earth”, that is the god of land must be appeased and this is why a Ground breaking ceremony is held. It is believed that if construction is begun without seeking the permission of the “kami”, it would anger the “kami”. 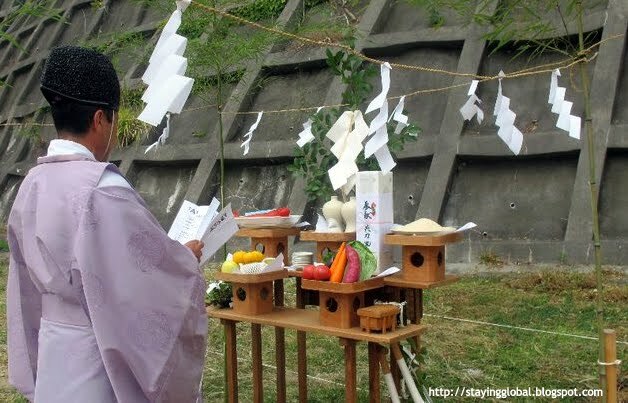 A Shinto purification rite or groundbreaking ceremony known as “Jichinsai” is organized to seek the kami’s permission and blessings before the commencement of construction work. This rite is also performed to pray for safety of the construction workers and smooth completion of the construction activity without any accidents and delays. The “Jichinsai” ceremony is conducted by Shinto priests and begins with a handwashing ritual. 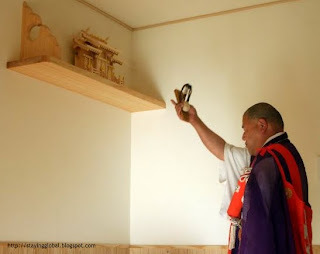 The priest erects a small altar where offerings are placed. 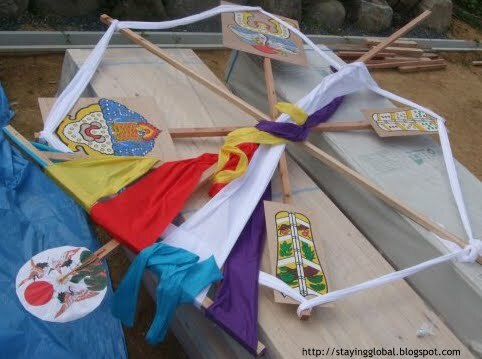 Bamboo branches are erected on four sides around altar. 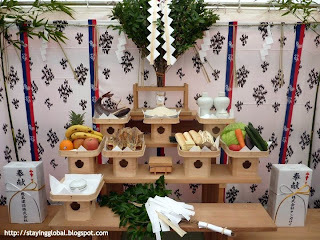 The Offerings include fruits, vegetables, fresh fish, dried fish and sake. Prayers are held to request the “kami” to descend. 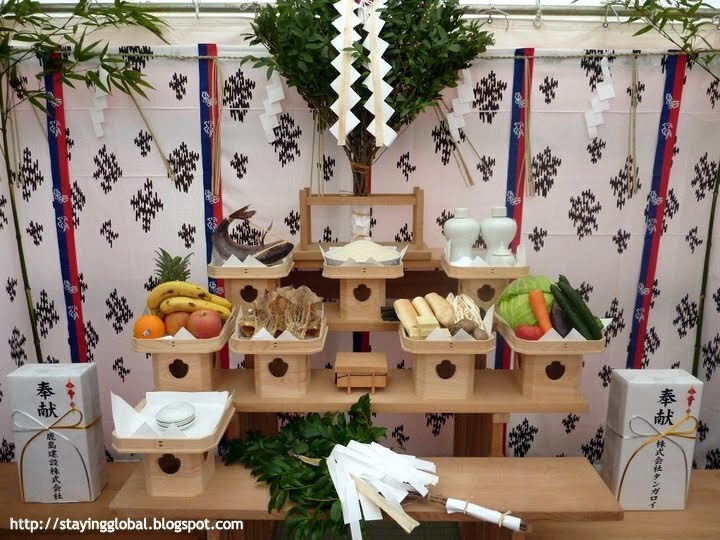 The offering of food and drink is made to the “kami” and sake is poured on the four corners of the construction site. Salt is sprinkled on the ground to purify it. 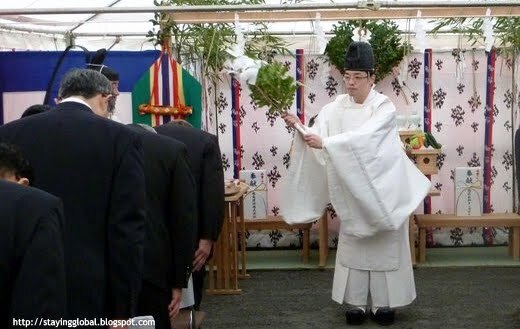 The priest waves the “Haraigushi” a wand of paper or branches of trees as part of the purification rite. The attendees sit or stand with their heads bowed down during most of the purification rituals. 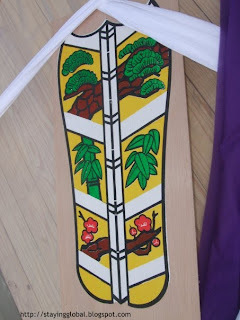 The “Kusakari-hajime” or first ground clearing ritual is performed using a wooden tool, usually a plough or sickle. 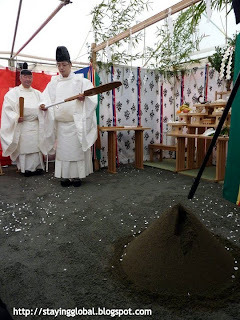 Next is the “Ügachizome” in which a small mound of earth is demolished with a ritual wooden spade, to symbolize the act of “breaking” the ground. Finally, a symbolic burial of the “Izumemono”, the article of enshrinement is conducted. The actual burial takes place much later during the construction activitiy. Finally, the ceremony concludes with a thanksgiving bow after which more salt and sake is scattered on the ground. Prayers are recited requesting the “kami” to ascend. Sake and food are then served to the attendees to celebrate the completion of the Ground breaking ceremony. Groundbreaking ceremonies are usually small events and only a small group comprising the immediate family is invited to attend. In case of companies, only the senior employees, representatives of the construction company, architects and builders attend the ceremony. 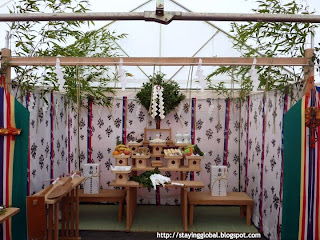 After the framework of the house is prepared, another Shinto ritual is sometime’s held. Again a small altar with offerings is placed and some prayers are offered. At this time, some symbolic wooden charms are also enshrined in the roof. These are supposed to keep evil spirits away. The symbols on these charms are supposedly for protection and longevity. 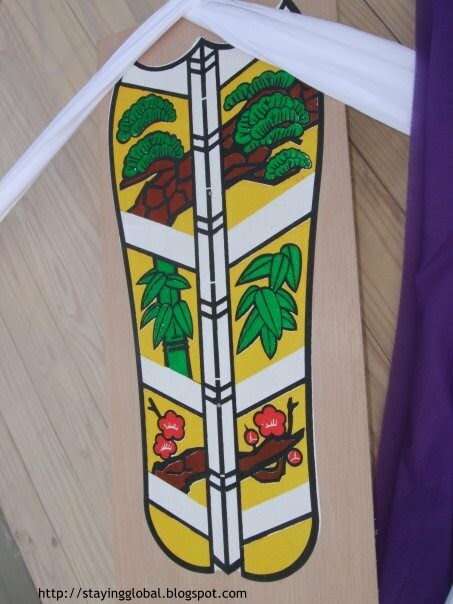 Symbols of pine, bamboo and plum branches are also engraved or painted upon these wooden charms or arrows. Once the construction is completed, a ceremony is held before moving in. Again this is similar to the “grihapravesh” ceremony held by Hindus. The housewarming is actually a very small and simple ceremony, which is attended by close relatives and few close friends. 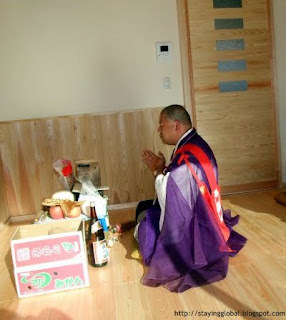 In keeping with Japan’s cocktail religion approach, usually the housewarming ceremony is conducted by a Buddhist priest. What a sight, a Buddhist priest praying before a household’s Shinto shrine for longevity, prosperity and protection of the family. During the house warming ritual, salt is usually sprinkled in front of the house to keep evil spirits away. 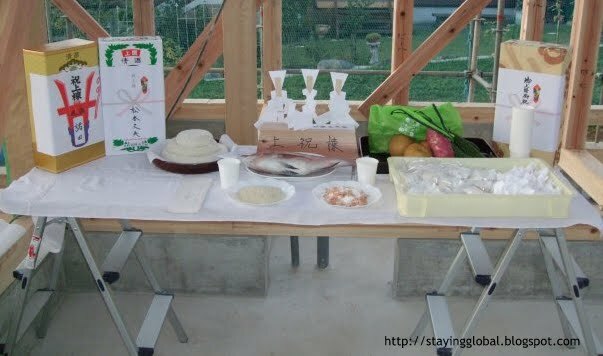 Purification of the house is done by placing offerings of dried fish, salt and rice in various corners. 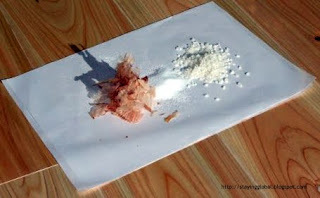 In case of independent houses (called mansions), a mixture of salt, dried fish and rice with a sprinkling of sake and water on top is carried in the hand while encircling the house. Usually the priest leads followed by the family.This is for purification. Sake is also poured in sinks, baths and toilets to keep evil away. Nowadays it is common for people to host a formal dinner or a party to celebrate the building of purchase of a new home. Needless to say, people invited to these parties should carry some gift for the hosts. Most often, foreigners are puzzled over choosing a gift. In Japan, there are many beliefs associated with gifting and as such people often worry whether something will be considered inappropriate. In Japan,it is common to give gifts which have utility in daily routine. As such some great gifting ideas would be hampers of soap, fruit boxes, flowers, blankets and futons, electrical appliances, chopsticks, pots or pans, decorative items and food stuff. At times I have seen people purchasing bags of tissue rolls as gifts. Something I could not imagine doing back home! People also buy a bottle of wine or sake when visiting people for the first time. Whatever the gift, it needs to be wrapped up nicely as a lot of importance is given to the presentation of gifts in Japan. When people move into a new neighbourhood, they are expected to visit atleast their immediate neighbours to introduce themselves, with a box of sweets or fruits (sometimes even soap!) as a gift. Anyone not doing this is labeled as “unsocial”. When we moved to our home in Iwaki, few colleagues of my husband accompanied us on such visits so that we could be appropriately introduced to our neighbours. Thanks for sharing your post... keep sharing content about builders I'm a frequent reader of your blog.. Thanks for informing us we really enjoying this blog your blog is so much informative so keep it up thanks guys.Aluminium Scaffolding Manufacturersin chennai. 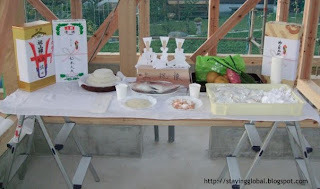 Great post, I have learned many things about Japanese house building from your article, very helpful. Villas in Madipakkam is the best place to buy villas in Chennai. (c) http://stayingglobal.blogspot.com. Awesome Inc. theme. Theme images by konradlew. Powered by Blogger.